The Senate Armed Services Committee chairman Carl Levin and ranking member John Warner in 2007 hearing opening statements during a confirmation hearing for a position in the Department of Defense. 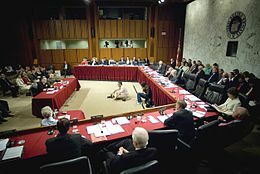 The Senate Armed Services Committee hearing testimony in the Hart Senate Office Building in 2007. A congressional committee is a legislative sub-organization in the United States Congress that handles a specific duty (rather than the general duties of Congress). Committee membership enables members to develop specialized knowledge of the matters under their jurisdiction. As "little legislatures", the committees monitor on-going governmental operations, identify issues suitable for legislative review, gather and evaluate information, and recommend courses of action to their parent body. Woodrow Wilson once wrote, "it is not far from the truth to say that Congress in session is Congress on public exhibition, whilst Congress in its committee rooms is Congress at work." It is neither expected nor possible that a member of Congress be an expert on all matters and subject areas that come before Congress. Congressional committees provide valuable informational services to Congress by investigating and reporting about specialized subjects. The growing autonomy of committees has fragmented the power of each congressional chamber as a unit. This dispersion of power has possibly weakened the legislative branch relative to the other two branches of the federal government, the executive branch and the judiciary branch. In his often cited article History of the House of Representatives, written in 1961, American scholar George B. Galloway (1898–1967) wrote: "In practice, Congress functions not as a unified institution, but as a collection of semi-autonomous committees that seldom act in unison." Galloway went on to cite committee autonomy as a factor interfering with the adoption of a coherent legislative program. Such autonomy remains a characteristic feature of the committee system in Congress today. Between 1994 to 2014, overall committee staffing was reduced by 35 percent. The number of hearings held in the House declined from 6,000 hearings per year in the 1970s, to about 4,000 hearings in 1994, and to just over 2,000 hearings in 2014. Commentators from both parties have expressed concern regarding the loss of committee capacity to research and develop legislative initiatives. 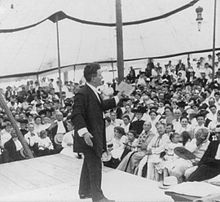 Governor La Follette of Wisconsin addressing the Chautauqua assembly in Decatur, Illinois in 1905. By 1906, the Senate maintained 66 standing and select committees—eight more committees than members of the majority party. The large number of committees and the manner of assigning their chairmanships suggests that many of them existed solely to provide office space in those days before the Senate acquired its first permanent office building, the Russell Senate Office Building. There were so many committees that freshman Senator Robert La Follette of Wisconsin was assigned chairmanship of the Committee to Investigate the Condition of the Potomac River Front at Washington. According to La Follette, he "had immediate visions of cleaning up the whole Potomac River front. Then [he] found that in all its history, the committee had never had a bill referred to it for consideration, and had never held a meeting." In 1920, the Congressional Directory listed nearly 80 committees, including the Committee on the Disposition of Useless Papers in the Executive Departments. By May 27, 1920, the Russell Senate Office Building had opened, and with all Senate members assigned private office space, the Senate quietly abolished 42 committees. The first House committee was appointed on April 2, 1789, to "prepare and report such standing rules and orders of proceeding" as well as the duties of a Sergeant-at-Arms to enforce those rules. Other committees were created as needed, on a temporary basis, to review specific issues for the full House. The House relied primarily on the Committee of the Whole to handle the bulk of legislative issues. In response to the House's need for more detailed advice on certain issues, more specific committees with broader authority were established. One of the first—a three-member committee "to prepare and report an estimate of supplies ... and of nett [sic] produce of the impost"—was established on April 29, 1789. The Committee on Ways and Means followed on July 24, 1789, during a debate on the creation of the Treasury Department over concerns of giving the new department too much authority over revenue proposals. The House felt it would be better equipped if it established a committee to handle the matter. This first Committee on Ways and Means had 11 members and existed for just two months. It later became a standing committee in 1801, a position it still holds today. An analysis of U.S. House of Representative committee request letters from the 92nd, 93rd, 97th, 98th, 100th, and 101st Congresses showed that the most common justifications raised by members seeking a committee assignment were prior professional experience, geography and electoral considerations, in that order. About 80% of justifications in letters fell into one of these three categories. Members who request an assignment to the House Armed Services Committee have a greater military presence in their district, while members requesting assignment to the House Interior Committee generally tend to come from sparsely populated areas with more land held in public trust. Joint committees are permanent panels that include members from both chambers, which generally conduct studies or perform housekeeping tasks rather than consider measures. For instance, the Joint Committee on Printing oversees the functions of the Government Printing Office and general printing procedures of the federal government. The chairmanship of joint committees usually alternates between the House and Senate. As of June 17, 2017, there were[update] four joint committees: the Economic, Library, Printing, and Taxation committees. A conference committee is an ad hoc joint committee formed to resolve differences between similar but competing House and Senate versions of a bill. Conference committees draft compromises between the positions of the two chambers, which are then submitted to the full House and Senate for approval. Apart from conference committees, most joint committees are permanent but temporary joint committees have been created to address specific issues (such as the Joint Committee on the Conduct of the War during the American Civil War). In the House of Representatives, there are 20 permanent committees, and 21 in the United States Senate. Four joint committees operate with members from both houses on matters of mutual jurisdiction and oversight. ^ George B. Galloway, History of the House of Representatives (New York: Thomas Y. Crowell, 1961), pp. 99–100. ^ Cannon's Precedents, vol. 7, sect. 1007, gives a short history of the discharge rules from early times to 1935. In 1910 the House established the first known discharge rule since the Civil War. In 1924 the House passed the rule requiring Congressmen's signatures on discharge petitions, and the required number of signatories was 150. [Congressional Record, 68 Congress 1, ppip and FDR opposed — and by a vote of 245 to 166 they raised the signature requirement to 218. [CR, 74 Congress 1, pp. 13–20]. Today's rule is identical to that of 1935. ^ The "21-day rule" applied to the Rules Committee alone; this rule was in force during 1949–1951, and 1965–1967, and it allowed the chairman of the legislative committee involved to bypass the Rules Committee and report a bill directly to the House floor, provided that three weeks had passed without a rule being reported for floor debate on the bill. See James A. Robinson, The House Rules Committee (New York: Bobbs-Merrill Co., 1963), pp. 70, 87; Congressional Record, 81 Congress 1, p. 10; CR, 89 Congress 1, p. 21; CR, 92 Congress 1, p. H69; Congressional Quarterly Almanac, 1967, pp. 180–81; CQ Weekly Report 29 (January 29, 1971): 257–258. ^ a b c Pascrell, Bill Jr. (January 11, 2019). "Why is Congress so Dumb?". The Washington Post. ^ Bartlett, Bruce (April 4, 2017). "How Congress Used to Work". POLITICO Magazine. Retrieved April 23, 2017. ^ U.S. House Journal. 1st Cong., 1st sess., April 2, 1789. ^ Frisch & Kelly, pp. 143-45. ^ Frisch & Kelly, pp. 108-09. ^ "Committees of the U.S. Congress". Retrieved June 17, 2017. Scott A. Frisch & Sean Q. Kelly, Committee Assignment Politics in the U.S. House of Representatives (University of Oklahoma Press, 2006). George B. Galloway, History of the House of Representatives (New York: Thomas Y. Crowell, 1961), pp. 99–100. "An Overview of the Development of U.S. Congressional Committees". CiteSeerX 10.1.1.165.5155.